Citation: Champagne CP, Savard T, Beaulieu C. A potential killer yeast to control secondary fermentation in vegetables. J Food Microbiol. 2017;1(1):14-21. Killer yeasts, Spoilage yeasts, Fermented vegetables, Mixed starter. Most sauerkraut or fermented vegetables sold in grocery stores are stabilized by heating or contain a preservative (sorbate or benzoate). However, there is a market for fresh products that contain live bacterial cultures. In Canada, such a fermented product can state the presence of probiotic bacteria on the label if the lactic starter includes Lactobacillus plantarum, and if its population remains above 1 billion CFU per portion until the “best before” date . These fermented vegetables are unfortunately prone to spoilage by yeasts during storage . Therefore, there is a need to prevent yeast spoilage of fermented vegetables during storage, when they contain live cultures, are not pasteurized and do not contain preservatives. 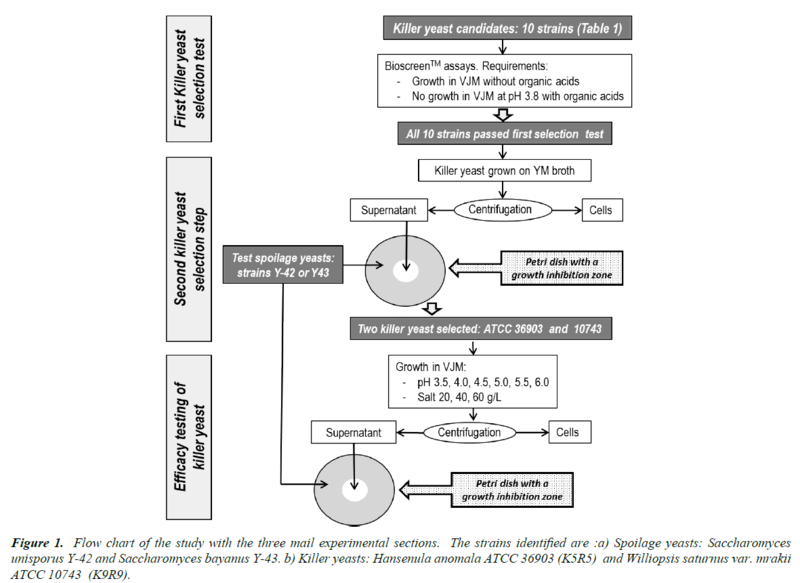 In this study, the addition of killer yeast to the lactic starter was considered, with the specific goal of improving the stability of the products against yeast spoilage. In fermented foods, yeast can either be useful (bread, wine or beer fermentation) or be detrimental, by negatively affecting the appearance (gas, turbidity) or the flavor of the products. Some yeast strains are useful to the food industry by synthesizing compounds, in these instance “killer” factors, that inhibit detrimental yeasts. Since the discovery of killer activity in Saccharomyces cerevisiae by , the killer yeast phenomenon has been reported in many studies [4-10]. The killer character from yeast is now known to be widely distributed in nature, having been detected in about 30% of the isolated yeast strains [11-13]. It is well documented that killer yeasts act by secreting a proteinaceous factor to which they themselves are immune into the medium [14-17]. To date, killer yeast strains have been reported in many yeast genera, including Saccharomyces, Candida, Cryptococcus, Debaryomyces, Hansenula, Kluyveromyces, Pichia and Torulopsis [18-20]. Ustilago , Rhodotorula and Trichosporon , Hanseniaspora , Williopsis and Zygowilliopsis [24,25] and Zygosaccharomyces , and have been classified into 11 groups (K1 to K11) according to their spectrum of activities. Killer yeasts have found applications in several areas. They have been used as a model for the mechanisms of regulation of eukaryotic polypeptide processing, secretion and receptor binding  and in recombinant DNA technology . In the food and fermentation industries, killer yeasts or only the killer characteristics have been used in order to combat wild yeasts and molds which contaminate the fermentation process of beer , wine  and bread . They have also been used as a biocontrol agent in the preservation of diverse foods during storage . To our knowledge, killer yeasts have never been used in the fermentation processing of vegetables as sauerkraut and Kim Chi, even though they have been isolated from fermented or salted vegetables [17,32]. The industrial lactic fermentation of vegetables, such as sauerkraut production, is generally carried out by a spontaneous fermentation and is the result of the growth of lactic acid bacteria. In this process, yeasts generally do not contribute to the primary acid fermentation but do appear during storage to carry out an undesirable secondary fermentation if there are residual sugars following the lactic acid fermentation. During this period, although flavor modification may occur, the main undesirable effect of this yeast-induced secondary fermentation is the production of CO2, which can cause post-packaging problems or bloater damage in cucumbers. Montano et al. studied the potential of a mixed starter composed of lactic acid bacteria and yeast to ferment carrots and showed that the mixed starter exhibited higher sugar catabolism but did not consider killer yeast . This strategy obviously raises the concern that the killer yeasts generate spoilage themselves. Therefore, the selection process of killer yeast for incorporation into a lactic starter must include the evaluation of the yeast’s ability to grow under pH, salt and organic acid levels encountered in fermented products. In this study, in order to select killer-yeast candidates for incorporation into a mixed starter culture, we evaluated the potential of 11 killer yeasts 1) to express killer factors under vegetable fermentation conditions but 2) not to grow extensively during the fermentation. The aim of this study was to find which killer types are effective against previously isolated spoilage yeasts, while not initiating spoilage themselves . Killer yeasts used in this study are listed in Table 1 and were obtained from the American Type Culture Collection (ATCC) in lyophilized form. Strains were rehydrated in 1:10 diluted Yeast and Mold broth (Difco laboratories, Detroit, Mich. U.S.A.) for 10 min at 23°C. The cell suspensions were then transferred to YM broth and incubated at their optimal growth temperature (Table 1) for 72 h. Cultures were streaked on acidified YM agar with 5N HCl (pH 4.0) and maintained on YM agar slants. Morphological examinations were performed on broth and agar cultures and gas production profiles were determined in test tubes containing YM medium and Durham tubes. 1Formerly Pichia anomala, also classified as Wickerhamomyces. Table 1. Killer yeasts strains and their growth temperature. Two spoilage yeasts were previously isolated from Onion with miso™ and Black radish™ products showing visible gas production during storage . The two strains were identified as Saccharomyces bayanus Y-43 and Saccharomyces unisporus Y-42 (St. Hyacinthe Research and Development Centre Canada). Identification was carried out using API 20 C (Biomérieux, Montréal, Canada) and SIM procedures . This study had three steps which are presented in a flow chart (Figure 1). The first was to select killer yeasts that would show limited growth in the vegetable juice medium, but that would not grow in the fermented product and spoil it during storage. The second step was to identify killer yeasts that are effective against two target spoilage yeasts. Finally, we wished to ascertain how fermentation conditions (pH and salt) could affect the synthesis of the killer factors by the yeast selected in steps 1 and 2. Figure 1. Flow chart of the study with the three mail experimental sections. The strains identified are :a) Spoilage yeasts: Saccharomyces unisporus Y-42 and Saccharomyces bayanus Y-43. b) Killer yeasts: Hansenula anomala ATCC 36903 (K5R5) and Williopsis saturnus var. mrakii ATCC 10743 (K9R9). For screening assays, the growth kinetics of yeasts for the abiotic factors of pH, temperature and the presence of organic acids were determined by automated spectrophotometry (AS) using a Bioscreen™ apparatus (Labsystems, Helsinki, Finland). YM broth at pH 6.0 or pH 3.5 (5N HCl) was inoculated at 0.1% (vol/vol) with a standardized cell suspension having an optical density (OD) of 0.5 (corresponding to 1 × 107 CFU/ml), and 250 μl was added to the microplate’s wells. Incubation of the microplates was carried out at 26°C for 48 h and OD was measured at 600 nm every 15 min. The microplates were shaken for 20 seconds prior to and after OD readings. In the aim of selecting killer yeast to be added to the lactic starter, which would not overgrow during fermentation, it was deemed essential that growth of the yeast strain should be inhibited in the final stages of the lactic fermentation. The fermented vegetables produced with the commercial lactic starter (Caldwell Bio Fermentation Canada, Ste-Edwidge, QC, Canada) typically reach a pH of 3.5 and have 8 g/L lactic acid and 4 g/L acetate . Therefore, the growth kinetics of killer yeasts at various pH and in the presence of organic acids, was ascertained using the AS procedure previously. The data were imported into SigmaPlot software (Systat Software Inc., San Jose, CA, USA). Model regression curves were generated, and the ones giving the highest R2 values were selected. Typically they were of the 3rd or 4th order. ODmax was calculated by subtracting the base level OD (at time 0) from the highest OD level of the curve (not of the data itself). The μmax value was obtained simply by calculating the slope (derivative) at the point in the curve where growth increases were highest. YM broths containing killer toxins were obtained from cultures propagated at 30°C for 72 h in 15 ml test tubes, without agitation. Yeast cells were removed by centrifugation at 4500 x g (10 min/4°C), and the cell-free supernatant (crude toxin) was recovered, filtered through 0.45 μm nitrocellulose membranes (Millipore, Milford, Mass., U.S.A.) and frozen at -20°C until required as freezing did not affect the activity . The sensitivity of the two target yeasts (S. bayanus Y-43 and S. unisporus Y-42) to the 11 killer yeasts was determined with methylene blue agar (MBA) using the technique of . MBA was prepared in a citrate-phosphate buffer (pH 4.5). MBA was distributed in portions of 15 ml in test tubes which were autoclaved at 121°C for 15 min and cooled to 45°C before addition of target yeasts to attain a final cell number of 1 x 105 per tube. The cell suspension seeded into the molten MBA agar was mixed gently and then poured into Petri dishes. Killer activity of the 11 yeasts was evaluated based on the inhibition of growth of the target yeasts on MBA agar. Positive results were revealed by clear zones surrounding the disk in the agar. The crude toxin preparation of given YM-grown killer yeast was pipetted (100 μl) onto two sterile 12-mm-diameter concentration disks (Bacto Disk, Difco Laboratories, Detroit, Mich., U.S.A.) and was deposited on the disks. A single streak of the killer strain used to prepare the cell-free extract was also drawn on the agar. Target yeasts grew as a background “lawn” and inhibitory activity was evident as a zone of clearing around the disk and/ or the streak; the clear zone was bordered by blue stained (dead) colonies if fungicidal activity was present. Plates were incubated at 30°C for 72 h and were stored at 4°C for 2 weeks to enhance the blue staining. Three independent trials were performed in duplicate and inhibition zones were measured (mm). Since the optimal conditions for growth of killer yeasts are not necessarily the same as those for the production of toxins, the effect of some growth parameters on killer toxin production were evaluated. The AS and MBA assays enabled the selection of 2 killer yeasts effective against the spoilage yeasts, Hansenula anomala ATCC 36903 (K5R5) and Williopsis saturnus var. mraki ATCC 10743 (K9R9), and further trials were carried out on media that simulated fermented vegetable products. The 2 selected killer yeasts (K5R5 and K9R9) were inoculated in vegetable juice media (VJM) prepared as described by Gardner . This VJM was composed of 61% of carrot juice, 12% cabbage juice, 3% onion juice and 24% of brine containing 83 g/L sea salt. Influences of salt concentration (20, 40, and 60 g/L) and pH (6.0, 5.0, 4.5, 4.0 and 3.5) on killer toxin production were evaluated. For assays on the effect of pH and salt, tubes were incubated at 20°C in VJM. Incubation times at 20°C varied (Table 2) because the sampling for killer activity was done 5 h after the start of the stationary growth phase. This ensured that samples have an equivalent biomass and physiological state. One series of assays at pH 4.5 and with 20 g/L salt was carried out at 30°C. Table 2. Effect of the pH or salt concentration in a vegetable juice medium (VJM), on the incubation times required for Hansenulas anomala ATCC 36903 (K5R5) and Williopsis saturnus var. mraki ATCC 10743 (K9R9) to reach 5 hours into the stationary growth phase. Killer activity in the VJM was quantified using well diffusion plate assays  instead of disks as described above. Wells were done with a sterile 5 ml pipette and had a diameter of 8 mm. In some instances, the zones were fringed with blue-stained (dead) colonies . Target yeasts S. bayanus Y-43 and S. unisporus Y-42 were seeded in molten MBA, and crude yeast-fermented VJM was distributed in 50-μl aliquots into the wells (8 mm diameter). Plates were incubated at 20°C for 72 h and inhibition zones were measured. This project was designed to help the marketing of sauerkraut-like products that are not pasteurized, and that do not contain preservatives such as benzoic or sorbic acid. Such products contain live lactic acid bacteria, such as for yogurt. Unfortunately, these products are at risk for yeast spoilage during storage. Thus, the overall aim of this study was to select killer yeasts that could be added to a lactic starter used to inoculate fresh vegetables and generate stable fermented vegetables with reduced risk of secondary fermentation [35,36]. All killer yeasts tested in this study produced a significant amount of gas in YM medium. These points to the potential for unwanted gas production by killer yeast in the vegetable products. A typical growth curve of killer yeast in YM broth at pH 6.0 and pH 3.5 is shown in Figure 2. From such curves illustrating killer yeast growth in VJM, μmax and ODmax were determined (Table 3). It is important to re-state that pH 3.5 was chosen since it is the typical pH found in sauerkraut and other fermented vegetables inoculated with the commercial starter used in this study. Lowering the pH of the broth to 3.5 did not significantly influence μmax values of most strains (Table 3) (paired t-test, P=0.20). However, the ODmax values were, on average, 10% lower in the acidified media, and this difference was highly significant (P=0.002). Therefore, a pH of 3.5 in itself would not prevent growth of the killer yeasts during storage, so combined effects of pH and organic acids were examined. Figure 2. Growth of Kluyveromyces lactis ATCC 36906 in YM broth at pH 6.0 (○) or pH 3.5 (□) at 26 °C. Table 3. Effect of pH (3.5 or 6.0) and the presence of organic acids (lactate or acetate) on some growth parameters of killer yeasts in YM broth. Heterolactic fermentation typically occurs during the fermentation of vegetables, principally due to Leuconostoc metabolism. With the starter used in this study, fermentation typically results in the production of 8 g/L lactic acid and 4g/L acetic acid . In the present study, the inhibitory effect of these organic acids concentrations was in function of the pH and the strains. In the presence of the organic acids at pH 6.0, two killer yeast strains had a negligible growth, while the others had, on average, 26% lower μmax values and 20% less biomass (Table 3). However a very strong inhibitory effect of the organic acids occurred at pH 3.5, since none of the strains grew in YM broth containing lactic and acetic acids (Table 3). Preventing the growth of the killer yeasts in the fermented products was considered an essential criterion for their incorporation into the lactic starter. It was deemed that the killer yeasts should grow and produce killer factors during the initial stage of fermentation. Data from the literature indicate that a high production of killer factors can indeed occur during the early phases of microbial growth . Once the lactic fermentation is complete, further growth of killer yeasts would be undesirable, since this could lead to spoilage of the fermented vegetables during storage. The results obtained on YM broths suggest that growth of the killer yeasts would stop towards the end of the lactic fermentation period, due to the combined effect of pH and organic acids. The sensitivity of yeasts to organic acids was previously reported ,  and the present study provide additional results to the literature in this regard. Inhibition at pH=3.5 is potentially associated with the un-dissociated form of the organic acids since lactate and acetate have pKa of 3.86 and 4.75, respectively. Since all killer yeasts were inhibited by the pH and organic acid conditions encountered in the fermented vegetable products, all of them were tested for their fungicidal properties against both spoilage yeasts. Results on MBA plates indicated that strains K5R5, K8R8, K9R9 and K10R10 have fungicidal effects (zones bordered by blue-stained colonies) on S. unisporus Y-42, while strain K7R7 appears to have only a fungistatic effect (clear zone not bordered by blue-stained colonies). Other killer yeasts had no effect on strain Y-42. Killer activity against the target yeast S. bayanus Y-43, was only observed with cultures of K5R5 and K9R9. The screening results obtained on MBA indicate that toxin producers K5R5 and K9R9 were the most efficient against both spoilage yeasts used as targets in this study. Further selection steps for the best killer yeasts were then focused on the ability of those killer yeasts to produce toxins in simulated conditions of vegetable fermentation. Parameters that can be modified in the production of fermented vegetables include the salt level and the incubation or storage temperature. Vegetable fermentation with lactic cultures being characterized by acidification, it was also deemed important to determine the effect of pH on the production of killer factors. The biomass level and physiological state influence the production of killer factors [5,7]. Since pH and salt levels affect the growth rate (Figure 3), by adapting the incubation times (Table 2), we ensured that all the killer yeast culture samples were taken at similar biomass levels, and growth phase. Figure 3. 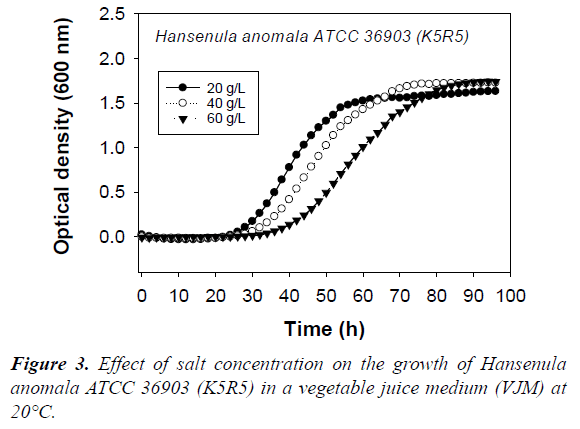 Effect of salt concentration on the growth of Hansenula anomala ATCC 36903 (K5R5) in a vegetable juice medium (VJM) at 20°C. Before analyzing the samples fermented by the killer yeast, it was first determined whether the growth media themselves were inhibitory to the target yeasts. None of the samples taken from the 8 unfermented VJM media (5 pH and 3 salt levels) produced inhibition zones on either of the target yeasts. The same is also true for the target cultures exposed to their own fermented VJM. Thus, ethanol in the yeast-fermented VJM media was not at an inhibitory level. The pH of the medium affected the production of the killer factors. With strain K5R5, the lower the pH the greater was the inhibitory activity (Table 4). Strain K9R9 had a more constant production level of the inhibitory compounds over the pH 4.5 to 6.0 range. Of the two strains producing the killer factors, Hansenula anomala ATCC 36903 (K5R5) had the highest activity against the two target spoilage yeasts. Data from the literature show that optimum activity of the killer factor are at acid levels, and pH values around 3.5 often seem optimal . Results of this study are in agreement with the literature on this respect, and furthermore suggest that the highest production also occurs at low pH levels. Thus, from a pH perspective, fermented vegetables  seem appropriate for taking advantage of killer yeasts properties, since the acid conditions obtained at the end of the fermentation are good for both production and activity of the killer factors. Table 4. Effect of salt concentration or pH of the VJM medium on the inhibitory activity of Hansenula anomala ATCC 36903 (K5R5) or Williopsis saturnus var. mrakii ATCC 10743 (K9R9) towards spoilage yeasts Saccharomyces unisporus Y-42 and Saccharomyces bayanus Y-43. Values are of the diameter (mm) of the inhibition zones. Many killer toxins are dependent on NaCl for highest activity . Salt is almost always used in the manufacture of fermented vegetables in order to selectively favor the development of lactic acid bacteria over contaminating soil bacteria. Thus, as was the case for pH, from a salt content perspective, fermented vegetables present conditions that favor the activity of killer toxins. Results of this study show that 20 to 40 g/L of salt allow the production of the K5R5 toxins (Table 4). However, even if good growth of Hansenula anomala ATCC 36903 (K5R5) occured in VGM with 60 g/L of salt, albeit slower than at 20 or 40 g/L (Figure 3), production of the toxin is reduced. The same occurred with Williopsis saturnus var. mrakii ATCC 10743 (K9R9), but absence of production was noted at 40 g/L. Thus, the production of killer toxins by strain K9R9 appeared more sensitive to salt than that of K5R5. Our results suggest that the killer yeast Hansenula anomala ATCC 36903 (K5R5) is a better choice than Williopsis saturnus var. mrakii ATCC 10743 (K9R9) for the preparation of a mixed lactic-yeast starter culture for use in vegetable fermentations. Hansenula (formerly Pichia, also classified as Wickerhamomyces) cultures are often found in the vegetable microbiota . Hansenula anomala ATCC 36903 seems compatible with lactic fermentation conditions of vegetables, since good growth and activity in VJM was observed at 20°C, in the pH range and salt concentration characterizing fermented vegetables. Furthermore, K5R5 should not represent a spoilage threat since it is sensitive to the organic acid levels at the pH reached following the lactic fermentation. The usefulness of Hansenula anomala for the biocontrol of unwanted microorganisms in wheat was previously demonstrated by Petersson and Schnürer, and the present study contributes useful data to the literature for the fermented vegetables sector . When considering the possibility of inoculating a mixture of lactic bacteria and killer yeasts into vegetables, the question arises as to the ability of the killer yeasts to produce a sufficient amount of killer factors during the short lactic fermentation period and the LAB: yeast ratio to provide an appropriate lactic fermentation. Indeed, a previous study  showed that the lactic fermentation is basically completed after 72 h at 20°C in the presence of 20 g/L salt. Data from the present study suggest that it would take strain K5R5 between 74 and 90 h to reach the stationary growth under these parameters (Table 2). These data suggest that strain K5R5 could have reached a substantial biomass level after 72 h of fermentation. It might be possible to adapt the fermented vegetable production process to favor yeast development and activity. Hansenula anomala K5R5 cultures grown at 30°C had 40 % higher killer activity that those grown at 20°C (data not shown). Therefore, increasing the incubation temperature could potentially improve the bioactivity of the killer yeast in the mixed starter. The production of killer factors can occur during the early phases of microbial growth . This would need to occur in the current process. Indeed, data from this study show that the killer yeasts would grow in VJM at the beginning of the fermentation, when pH is at pH 6.0. However, even if the killer yeasts can grow at pH 3.5 as such, the gradual increase in organic acids during the lactic fermentation would eventually inhibit their growth at that pH level. As a result, it has yet to be established at what point during the lactic fermentation growth of Hansenula anomala ATCC 36903 would stop, and if the quantity of killer toxins produced at that point would allow protection against growth of the spoilage yeasts. It also needs to be ascertained if the limited growth of Pichia during the fermentation would nevertheless affect the sensory properties of the product. Finally, the safety of ATCC strain 36903 for use in foods could be confirmed. It is currently classified as a “level 1” organism  which is considered safe for healthy individuals. There are no clinical data that report health concerns with this particular strain. Nevertheless, some yeast produce antibiotics or toxic compounds  and surveillance are desirable. It must be kept in mind that, as for probiotics, yeast can become opportunistic pathogens in highly immunosuppressed individuals . This preliminary study was designed to examine if killer yeasts, could potentially be included in a lactic starter in order to reduce the growth of common spoilage yeast in fermented vegetables that and marketed without pasteurization or additives. The selection process was based on the ability of the killer yeasts 1) to produce killer factors in a vegetable-based medium; and 2) to inhibit the growth of two previously isolated spoilage yeasts. Another criterion was that the yeast could not themselves become a spoilage agent of the fermented products. Among the 11 ATCC strains, Hansenula anomala ATCC 36903 (K5R5) was found to be the best candidate for this purpose in regards to its fungicidal properties against previously isolated spoilage yeasts. The actual debate to rename this species as Hansenula anomala has not been into accounts inside this publication but the presented conclusions can probably be applied under this nomenclature as well. Assays are currently under way to test the novel “lactic-killer yeast” starter in fermented vegetables. Biocompatibility studies need to be conducted between the strains of the commercial lactic starter and the killer yeast K5R5. Additionally, assays on the yeast inoculation level required to produce the inhibitory conditions need to be determined obviously, the sensory properties of the resulting fermented vegetables will also need to be studied. A technology transfer of this mixed starter in a Kim Chi fermentation model is currently under way. CFIA(2017) Canadian Food Inspection agency. Savard T, Beaulieu C, Gardner NJ, et al. Characterization of spoilage yeasts isolated from fermented vegetables and inhibition by lactic, acetic and propionic acids. Food Microbiol. 2002; 19(4): 363-73. Bevan EA, Makover M. The physiological basis of the killer character in yeast. In: Geerts SJ, Abeelen JHFV(eds) Genetics today: proceedings of the XI International Congress of Genetics, The Hague, The Netherlands. Symposium Publication Division, USA. 1963; 202-3. Young TW. Killer Yeasts, The Yeasts. 1987. Academic Press, UK. Polonelli L, Conti S, Gerloni M, et al. Interfaces of the yeast killer phenomenon. Crit Rev Microbiol. 1991; 18(1): 47-87. Van Vuuren HJJ, Jacobs CJ. Killer Yeasts in the Wine Industry: A Review. Yokoi K, Nakashima M, Suzuki C, et al. Inhibition of growth of pellicle forming yeasts by a killer toxin produced by a Debaryomyces hansenii KYT-1. Nippon Shokuhin Kagaku Kogaku Kaishi. 1996; 43(10): 1152-57. Kono I, Himeno K. A novel killer yeast effective on Schizosaccharomyces pombe. Biosci Biotechnol Biochem. 1997); 61(3): 563-64. Waema S, Maneesri J, Masniyom P. Isolation and identification of killer yeast from fermented vegetables. As J Food Agro-Ind. 2009; 2(4): 126-34. Heard GM, Fleet GH. Occurence and growth of killer yeasts during wine fermentation. Appl Environ Microbiol. 1987; 53(9): 2171-74. Jacobs CJ, Fourie I, van Vuuren HJJ. Characterization of killer yeast isolates from chenin blanc grapes and grape skins. S Afri J Enol Viti. 1991; 12(2): 57-63. Starmer WT, Ganter PF, Aberdeen V. Geographic distribution and genetics of killer phenotypes for the yeast Pichia kluyveri across the United States. App Environ Microbiol. 1992; 58(3): 990-97. Woods DR, Bevan EA. Studies on the nature of the killer factor produced by Saccharomyces cerevisiae. J Gen Microbiol. 1968; 51(1): 115-26. Bussey H. Effects of yeast killer factor on sensitive cells. Nat New Biol. 1972; 235: 73-75. Marquina D, Santos A, Peinado JM. Biology of killer yeasts. Int Microbiol. 2002; 5(2): 65-71. Izgü F, Altinbay D, Acun T. Killer toxin of Pichia anomala NCYC 432; purification, characterization and its exo-β- 1,3-glucanase activity. Enzyme Microbial Technol. 2006; 39(4): 669-76. Philliskirk G, Young T. The occurrence of killer character in yeasts of various genera. Antonie Van Leeuwenhoek. 1975; 41: 147-51. Deak T, Beuchat LR. Handbook of food spoilage yeasts. 1996. CRC Press, USA.Stumm C, Hermans JMH, Middelbeek EJ. Killer-sensitive relationships in yeast from natural habitats. Antonie van Leeuwenhoek. Int J Gen Mol Microbiol. 1977; 43(2): 125-8. Young TW. The Properties and Brewing Performance of Brewing Yeasts Possessing Killer Character. J Am Soc Brew Chem. 1982; 42: 1-4. Kandel J, Koltin Y. Killer phenomenon in Ustilago maydis: comparison of the killer proteins. Experim Mycol. 1978; 2(3): 270-8. Morace G, Archibusacci C, Sestito M, et al. Strain differentiation of pathogenic yeasts by the killer system Mycopathologia. 1983; 84(2-3): 81-5. Radler F, Pfeiffer P, Dennert M. Killer toxins in new isolates of the yeasts Hanseniaspora uvarum and Pichia kluyveri. FEMS Microbiol Lett. 1985; 29(3): 269-72. Kazantseva DI, Zimina MS. Yeast Killer Strains with a Broad Action Spectrum Looked for Among Collection Strains and Their Preliminary Classification. Microbiologiya 1989; 58(2): 291-7. Vustin MM, Bab'eva JP, eshetova IS, et al. Use of the Sensivity of the Basidiomycete Yeasts to the Killer Toxin of Williopsis pratensis for taxonomic differenciation. Microbiologiya. 1991; 60(2): 345-9. Radler F, Herzberger S, Schonig I, et al. Investigation of a killer strain of Zygosaccharomyces bailii. J Gen Microbiol. 1993; 139(3): 495-500. Sossin WS, Fisher JM, Scheller RH. Cellular and molecular biology of neuropeptide processing and packaging. Neuron. 1989; 2(5): 1407-17. Dignard D, Whiteway M, Germain D,et al. Expression in yeast of a cDNA copy of the K2 killer toxin gene. Mol Gen Gen. 1991; 227(1): 127-36. Boone C, Sdicu AM, Wagner J, et al. Integration of the yeast k1 killer toxin gene into the genome of marked wine yeasts and its effect on vinification. Am J Eno Viti. 1990; 41(1): 37-42. Bortol A, Nudel C, Fraile E, et al. Isolation of yeast with killer activity and its breeding with an industrial baking strain by protoplast fusion. Appl Microbiol Biotechnol. 1986; 24(5): 414-6. Palpacelli V, Ciani M, Rosini G. Activity of different 'killer' yeasts on strains of yeast species undesirable in the food industry. FEMS Microbiol Lett. 1991; 84(1): 75-8. Suzuki C, Yamada K, Okada N, et al. Isolation and characterization of halotolerant killer yeasts from fermented foods. Agri Biol Chem. 1989; 53(10): 2593-7. Walker GM, McLeod AH, Hodgson VJ. Interactions between killer yeasts and pathogenic fungi. FEMS Microbiol Lett. 1995; 127(3): 213-22. Gardner NJ, Savard T, Obermeier P, et al. Selection and characterization of mixed starter cultures for lactic acid fermentation of carrot, cabbage, beet and onion vegetable mixtures. Int J Food Microbiol. 2001; 64(3): 261-75. Young TW, Yagiu M. A comparison of the killer character in different yeasts and its classification. Int J Gen Mol Microbiol. 1978; 44(1): 59-77. Montaño A, Sánchez AH, Rejano L, et al. Processing and storage of lye-treated carrots fermented by a mixed starter culture. Int J Food Microbiol. 1997; 35(1): 83-90. Magliani W, Conti S, Gerloni M, et al. Yeast killer systems. Clin Microbiol Rev. 1997; 10(3): 369-400. Moon NJ. Inhibition of the growth of acid tolerant yeasts by acetate, lactate and propionate and their synergistic mixtures. J Appl Bacteriol. 1983; 55(3): 453-60. Young TW. The Genetic Manipulation of Killer Character into Brewing Yeast. J Inst Brew 1981; 87: 292-5. Liu GL, Chi Z, Wang GY, et al. Yeast killer toxins, molecular mechanisms of their action and their applications. Crit Rev Biotechnol. 2015; 35: 222-34. Gobbetti M. The sourdough microflora: Interactions of lactic acid bacteria and yeasts. Trends Food Sci Technol. 1998; 9(7): 267-74. Petersson S, Schnurer J. Biocontrol of mold growth in high-moisture wheat stored under airtight conditions by Pichia anomala, Pichia guilliermondii, and Saccharomyces cerevisiae. Appl Environ Microbiol. 1995; 61(3): 1027-32. ATCC, American Type Culture Collection, USA (2017). SatyanarayanaT, Kunze G Yeast Biotechnology: Diversity and Applications. 2009 Springer Press, Germany. Miceli MH, Díaz JA, Lee SA. Emerging opportunistic yeast infections. "Lancet Infect Dis. 2011; 11(2): 142-51.